Self catering holidays in a comfortable modern house with excellent views in Pitlochry, Perthshire in the beautiful Highlands of Scotland. Open all year. Holiday in a comfortable, modern semi-detached bungalow situated in a quiet location in Pitlochry about 500 metres from the main street - see our Pitlochry Pictures page. 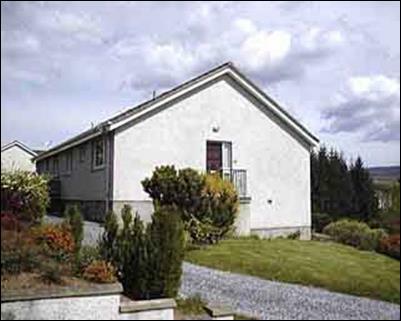 The house has excellent views over the Tummel Valley and is only a short walk to the shops and other facilities including the railway station. 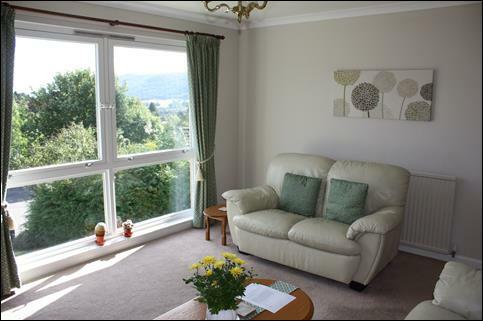 Ideal for touring, walking, golfing and fishing, or just enjoying local facilities such as the Pitlochry Festival Theatre, the salmon ladder at Pitlochry Dam and the whisky distilleries. Sitting room with two settees (a three seater and a two seater). 40” smart TV, digital video recorder, DVD player and radio-CD-cassette player. Excellent views from the large picture window. Recently refitted kitchen with built in gas hob and fan/conventional electric oven with grill; fridge, washing machine, microwave, kettle & toaster. Double bedroom and twin bedroom, all beds with duvets (linen and towels provided). Recently refitted bathroom with bath and overbath shower, w.c., wash hand basin & electric shaving point. Large travel cot and high chair available. Private car parking, off road. Enquiries to Ross and Lynda Gardiner, 3 Knockard Avenue, Pitlochry, Perthshire. PH16 5JE. Please telephone 01796 472157 (within UK) or +44 796 472157 (international), or email ross@pitlochryselfcatering.co.uk to check availability, get more details, or make a provisional booking (see Conditions of Hire and Booking Form). We have a brochure with full information and photographs of all rooms, which we will be pleased to send to you by email or post. Normally let only for complete weeks, Saturday to Saturday. Short breaks and other periods will be considered off-season, or at short notice.